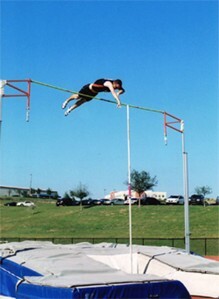 When I was in high school, pole vaulting was only for boys. Today, collegiate women are clearing 15-ft regularly. The vaulter in this picture to the right is clearing roughly 15.5 feet. That's a really impressive vault, but it's nowhere near the current world record: 20-ft, 2.5 inches (6.16 meters) by French vaulter Renaud Lavillenie. He cleared it on February 15, 2014, breaking the 20-yr old record held by Russian legend Sergey Bubka. There are videos of Lavillenie's vault online; it's incredible to watch! RIDE A BICYCLE ACROSS THE CONTINENTAL US! Quite a few people have ridden a bicycle across the continental US. In fact, several AthleteInMe.com® fans have done it and are featured in our GALLERY. Typically, they will ride from the west coast to the east coast and ride a little over 3000 miles. That's definitely a phenomenal achievement. But, during the summer of 2018, Paul Stankiewicz (age 57) rode 5000 miles! On June 13th, he rented a car and drove from New Hampshire to Eureka, California, where he started his ride. From the redwood forests of northern California, he rode to Yellowstone National Park, then, down into Missouri, and then headed back towards the northeast. He made it to Wallis Sands Beach near his home in Rye, NH, on October 17th. And he towed his dog Mona behind him in a trailer the entire way! Here's a brief story about him in Bicycling magazine. AN ALMOST UNBELIEVABLE BICYCLE RIDE! Christi Bruchok and Tauru Chaw (Phoenix, AZ): Christi and Tauru set out from Ushuaia, Chile, the southern tip of South America, to ride a tandem bike up to....the northern edge of Alaska! That's about 16,000 miles. They flew from Phoenix, AZ to Ushuaia, Chile, but, then, had to wait several weeks for their bike to clear customs and arrive. They started their ride on January 19, 2012 and made it to Deadhorse in Prudhoe Bay, Alaska on August 2, 2013. Then, they rode from San Diego, CA back home to Phoenix. If you still aren't impressed, then consider this: both of them are legally blind! To read about their odyssey, go to: TwoBlindToRide.org. Andre Kajlich, of Edmonds, WA, lost his left leg at the hip and his right leg above the knee when he fell off a subway platform and was struck by a train in 2003. 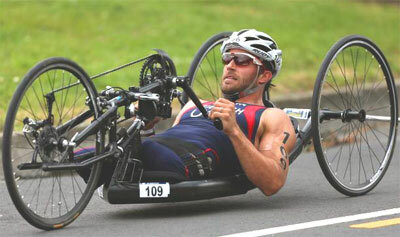 Kajlich is currently training to become the first solo hand cyclist to complete the Race Across America, which is more than 3000 miles. • Pam Reed (USA) is the race director for the Tucson Marathon. In 2002, she was the first woman to become the overall winner of the brutal Badwater Ultramarathon. In 2005, she became the first person to complete a 300-mile run without sleep, beating legendary Dean Karnazes (see below) to that milestone. She completed the distance in 79 hours and 59 minutes. (source: Runner's World magazine, Feb. 2006). In May 2009, she established the record for American women in 6-day ultramarathons during the "Self-Transcendence Race" in Queens, NY by running 490 miles. • Istvan Sipos (Hungary) ran a total of 12,526 miles over a span of 263 days, taking breaks to sleep and eat. This appears to be the longest "continuous" run ever recorded (source: Runner's World magazine, May 2004). • Yiannis Kouros (Greece): During the inaugural run of The Spartathlon in Greece in 1983, an unknown young Greek running his first ultramarathon demolished a world-class international field by winning in over 3 hours ahead of the next closest finisher. In the decade and a half since then, Yiannis Kouros went on to rewrite the world record books at every ultra event from 100 miles through 1,000 miles. Almost everyone came back from Greece suspecting that he had cheated. Half a year later, Edgar Patterman organized a 3-day, 200-mile stage race along the Danube in Austria. He specifically invited Kouros in order to test him. Some of the same international stars were in attendance (such as Dusan Mravlje of Yugoslavia, the favorite). With race officials and spectators watching virtually every step of the way, Kouros took off, left the field behind early, and even beat some of the official crews to the pre-set aid stations, averaging sub-7 minute miles for the first two days. Then, on the third day, he took it easy and ran the final stage with Mravlje. Three months later Kouros came to New York City to face an even more stellar field in the New York Transcendence 6-day race. That's where he ran 635 miles to bridge the century-old gap between modern and 19th century 6-day performers by breaking George Littlewood's all-time best of 623 miles. In that race Kouros broke 12 hours for the first 100 miles, ran about 165 miles for the first 24 hours, broke the 48 hour world record, hitting 266 miles at that point, and then just kept going. An indication of his long distance speed, Kouros' 24-hour track world record is 188-plus miles, which is about 7:40 per mile. Dean Karnazes (USA) has completed some absolutely mind-boggling distance runs over his lifetime. His running achievements began when he was a kid. One notable endurance run was a fundraiser where he ran laps on a track as a high school freshman. While his teammates averaged about 10-15 laps, Karnazes ran 105. In 2006, Karnazes ran 50 marathons in 50 days. And to make it even more challenging, each run was in a different state! The final one was the New York City Marathon, which he finished in a hair over 3 hours flat. Then, just for fun, after that he ran back to St. Louis where his 50/50/50 quest began. Yes, that's correct: he ran from New York City to St. Louis, MO, almost 1300 miles! Read more about Dean Karnazes at: www.UltraMarathonMan.com. • Paul Staso (USA): In 2006, Paul ran from the Oregon coast to the east coast in Delaware. He covered 3260 miles in 108 days. That's 30.2 miles per day, and, represents more running than Karnazes' 50/50/50 accomplishment. Paul's main purpose was to fulfill a promise he made to his wife's PE students. He also wanted to increase awareness in kids about the importance of health and fitness. To read about Paul, see: www.PaulStaso.com. • John Wallace III (USA): Starting on the Pacific coast of Washington September 26, 2004, Wallace ran 3800+ miles across America, finishing at Tybee Island, GA on January 29, 2005. Details of his run can be found at: www.SeeJohnRun.com. • Scott Jenkins and Rhys Jenkins (UK): Scott and Rhys are brothers. They once ran from Boston to Austin for charity. They covered the 2000 miles in 75 days. They only rested on 4 of those days and 2 of those were due to food poisoning. Then, in 2012, they teamed up with 6 others to run the entire circumference of Wales: 750 miles in 8 days. THE LONGEST WALK EVER ATTEMPTED? • Karl Bushby (UK): On November 1, 1998, Bushby, a former British paratrooper, set out from Punta Arenas, Chile (southern tip of Chile) to walk home.....not really a big deal until you realize his hometown is Hull in Northern England. Total distance: 36,000 miles! Preposterous? Yes. Impossible? Maybe not. Don't underestimate this guy. He has already walked the entire length of South America, Central America, and North America, though this has taken 13 years. He even crossed the Bering Strait under his own power. Where there was ice, he walked. Where there wasn't, he swam to the next big chunk....while hauling a 400-lb sled behind him. It took him 13 days to cover the 58 miles that separates Alaska and Russia. When he started out (from Chile) in 1998, Bushby had a laptop, a satellite phone, a solar-powered charger, and a few hundred dollars in his pocket. He bought a used pushcart which helped on rough roads. He initially planned to walk 20 miles per day, but the pushcart fell apart on the first day, and he lost his toenails after a week. In 2001, he reached the most dangerous part of the trip: the Darien Gap in Colombia, a jungle filled with jaguars, snakes, and armed revolutionaries. Here, he dyed his hair black and disguised himself as a Colombian drifter. At one point, he hid under a mat of branches and floated in the crocodile-infested Rio Atrato for 4 days with boats of soldiers passing just feet from his head. Once into Mexico, he obtained another pushcart and made it to the US border in 2002, only to encounter the 120-degree heat of the Mojave Desert. He followed the Rockies up into Montana. Close to the US-Canadian border, his push-cart was stolen. He lost all his gear, his passport, his maps, and all his notes up to that point. In the fall of 2003, he was in Fairbanks, Alaska. Here, he traded in his pushcart for a sled. After 6 years of heading north, he was now pointed towards the west. Nature, and 17,000 miles of walking, couldn't stop him, but the Russian government did. Just hours after reaching land (after crossing the Bering Strait), Russian authorities apprehended him and detained him for 58 days. In addition, their visa stipulates that he can be inside the country for no more than 90 consecutive days. Then, he must leave for 90 days. This might be acceptable, except for the fact that the tundra in Chukotka is swamp and, thus, can only be walked upon when it is frozen. So, this is how far he has traveled as of this writing (January 2017). He then walked from Los Angeles to the Russian Embassy in Washington DC to convince the Russian government to let him resume his walk where they stopped him. Jason Lewis did it. On October 6, 2007 -- after 13 years and over 45,000 miles! -- he arrived back in the UK. If the sheer distance involved isn't mind-boggling enough, stop and think how one would cross the oceans without a motor or a sail. So, how did he cross the oceans? He used a pedal-powered boat. No kidding. You can read more about his adventure at: www.Expedition360.com. • Cuba-to-Key West, 1st Attempt (1978): In 1978, American swimmer Diana Nyad (age 28) set out to swim from Cuba to Key West, Florida. That's 103 miles. But, there were strong winds and heavy waves. After 41 hrs and 49 minutes, her handlers informed her that she was so far off course that completing the swim would be impossible. She was devastated, exhausted, and dehydrated. She didn't give up. In 1979, on her 30th birthday, she swam from Bimini in the Bahamas to Jupiter, FL. That's 102.5 miles. Then, for the following 30 years, she didn't swim at all. "I was so burned out. You couldn't pay me to take one more stroke," Nyad said. But, when she turned 60, she decided to tackle the Cuba-to-Key West challenge again. She began training. In January 2010, she swam around the island of Mazatlan (Mexico). On July 10, 2010, she attempted to swim from a boat 40 miles to the beaches at Key West, Florida. After 24 hours, she had covered 30 of the 40 miles and climbed back into the boat. She was tired and dehydrated but felt that she could complete her goal to swim from Cuba to Key West. • Cuba-to-Key West, 2nd Attempt (2011): On Sunday evening August 7, 2011, 61-yr old Diana Nyad jumped into the waters of the Florida Straits to make her 2nd attempt to swim from Cuba to Key West. Unfortunately, after 29 hours, and battling ocean swells, shoulder pain, and even an asthmatic attack, she was forced to quit. • Cuba-to-Key West, 3rd Attempt (2011): A little more than a month later, she made a 3rd attempt. She was now 62 years old. On Friday evening September 23, 2011, she dove in at Havana's Hemingway Marina. After roughly 24 hours, she got stung in the face by jellyfish. This required medical treatment, but she pressed on. After a total of 40 hours of swimming and over 100,000 strokes, she finally gave up. • Cuba-to-Key West, 4th Attempt (2012): On August 18, 2012, Nyad tried again. This would be her 4th attempt. She swam for a total of 51 hours but again had to give up due to jellyfish stings and a lightning storm. • Cuba-to-Key West, 5th Attempt (2013): On Saturday August 31, 2013, at 8:59AM, Diana, now age 64, dove into the waters off of Cuba to try again. This time, she wore a special face mask to prevent jellyfish stings. The conditions were ideal. After 53 hours, she arrived at Key West. It was Monday September 2, 2013, about 2PM. I can't decide what is the most impressive aspect of this athletic feat: the sheer distance, her persistence despite failing 4 times, or the fact that she is 64 years old! Unbelievable. • Susie Maroney (Australia): At age 17, Susie Maroney swam the English Channel....two laps, no less! (England to France and back to England). It took her 17 hours and 14 minutes. In May 1997, at age 22, she became the first person to swim from Cuba to the US. One year later, she set the longest distance ever swum without flippers in open sea: from Mexico to Cuba. The distance was 122 miles and took 38 hrs and 33 minutes. And now for the astonishing part: Susie Maroney has cerebral palsy! 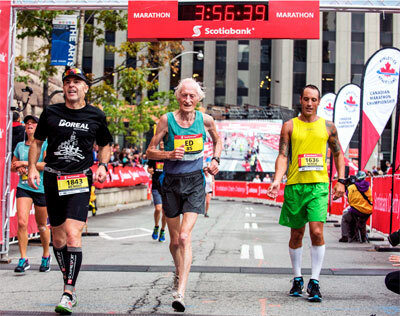 At age 73, he ran that same marathon in an even more astounding 2 hours 54 minutes 48 seconds. He is the only person older than 70 to have run a marathon in under 3 hours. • Bench-Press: According to an article in the May 2004 issue of Men's Fitness magazine, Gene Rychlak, Jr., Royersford, PA, bench-pressed 900 lbs! Then, in December 2006, he benched 1010 lbs. No, that's not a typo: One thousand ten pounds! • Pull-Ups: The greatest number of pull-ups performed in succession was 91 by a Marine recruit (source: Men's Health magazine, 2008). The record-holder for greatest number of pull-ups in a 24-hr period is David Goggins. On January 20, 2013, in Brentwood, TN, Goggins set the record: he completed 4030 pull-ups in 17 hours! It was his third attempt to break the record. On November 27, 2012, he completed 3207 pull-ups in 12 hours, but had to stop due to an injury on his right palm. • World's Hottest Foot Race: How about running 5 marathons in a row? And, while you're at it, turn up the heat, a little? The "Badwater Ultramarathon" is a 135-mile race from Death Valley to Mt. Whitney....during July! Temperatures can exceed 120 degrees. Think this is crazy? Well, yes, it is, though, this race has been held annually since 1977. (Pam Reed won it in 2002, and Dean Karnazes won it in 2004.) If you want to compete in what is billed as the "world's toughest foot race," go to: www.Badwater.com. • World's "Most Grueling" Foot Race: The "Spartathlon" in Greece describes itself as the "most grueling" distance run. This a footrace from Athens to Sparta.....the distance is 250 km, or 155 miles. It was first organized in 1983 to mimic the course Pheidippides covered when ordered to run to Sparta to obtain military reinforcements for the battle of Marathon in 490 BC. According to legend, Pheidippides completed the Athens-to-Sparta distance in 2 days. If you're interested in reliving ancient history, here is the web site: www.Spartathlon.gr. • World's Oldest and Largest Foot Race: The "Comrades Marathon" in South Africa is actually a 90 km (55.9 miles) ultramarathon. It originated in 1921. One year it is run "up" starting in Durban, and the alternating year it is run "down" from Pietermaritzburg. Athletes have 12 hours to complete the course. Also, there are a number of cut-off points along the route that runners must reach by a predetermined time or else be forced to retire from the race. For more information, go to: www.Comrades.com. • An Ultramarathon at High-Altitude: The "Leadville Trail 100" is an ultramarathon held annually on trails near Leadville, Colorado. The course is 50 miles out and back, starting at 10,200-ft elevation. At its highest point, the course crosses Hope Pass at 12,620-ft. This race was first run in 1983. It is common for less than half the competitors to complete the course in the required 30-hr time limit. For more information, go to: www.LeadvilleRaceSeries.com. • A Marathon at Even Higher Altitude: The "Everest Marathon" is listed in the Guinness Book of World Records as the highest marathon in the world. The starting line is at 17,000-ft elevation! The finish line is at the Sherpa town of Namche Bazaar (11,300-ft elevation). The course is 26.2 miles and consists of rough mountain trails. It was first held in 1987. For more information, go to: www.EverestMarathon.org.uk. Does a 3000-mile bicycle race interest you? If so, then the "Race Across America" is what you're looking for. This race has been held annually since 1982. It starts in Oceanside, CA and finishes in Annapolis, MD. The route goes through 14 states, and includes over 100,000 feet of climbing. The race can be done as a solo rider, or, as a team. Typically, solo racers finish in 9-12 days, averaging 250-350 miles per day. Teams have a relay format and race 24 hours per day. For more info, go to: www.RaceAcrossAmerica.org. If the Badwater race isn't extreme enough for you, how about this one? : The "4 Deserts" challenge involves running through Atacama Crossing (Chile), the Gobi Desert (China), the Sahara Desert (Egypt), and, finally Antarctica (it's a frozen desert). Each race is 250-km (150 miles) divided over 6 days. Yes, Dean Karnazes has done this event, too, but, of course, he had to put his own spin on it so he added in the Badwater Ultramarathon in Death Valley.... In November 2016, Jax Mariash Koudele, an endurance runner from Wyoming, became the first woman to complete the 4 Deserts Grand Slam Plus. If you're interested, the web site is: www.4Deserts.com. WARNING: Before you try to find what your body can endure, keep in mind that anyone -- including elite athletes -- can overdo it. Any abrupt increase in exercise, particularly if the new activity is something that you are not used to, can put you at risk for a very serious medical condition known as "rhabdomyolysis." If you do something extreme, and then notice that your urine is looking like Coca-Cola, and you have extreme muscle soreness, you need to seek medical attention immediately. To read more on this, go to: "Exertional Rhabdomyolysis." If you want to know who's currently trying to run across America, check out the web site "USA Crossers." (www.USACrossers.com). "Exercise Motivation Part 2: Psychology"
"Fluids and Electrolytes During Exercise"
"Pain Medications and the Athlete"
The details provided in this story were obtained from Men's Health magazine, National Geographic's Adventure magazine, Runner's World magazine and the various web sites cited above.